It’s the moment you’ve been waiting for… We’re thrilled to announce NAAYWOOD as our headliner for next week’s Coney Club Night #1 – Designed by kids. London based production duo NAAYWOOD was born in 2016, after originally meeting through a mutual appreciation of the tunes bleeding through their connecting flat walls in East London. As well as their production and remix work, they are two of the co-founders and resident DJs at the regular London party Jünipero. Listen to them here for an idea of what’s in store. That’s not all – it wouldn’t be a party without sharing the dance, fun and play with friends, so we’ve created a special group discount with 5 tickets for £100 (plus booking fee). Tickets include entry, six drinks each, and activities especially curated by kids, which means glitter, Lego, Simon Says, and much more. 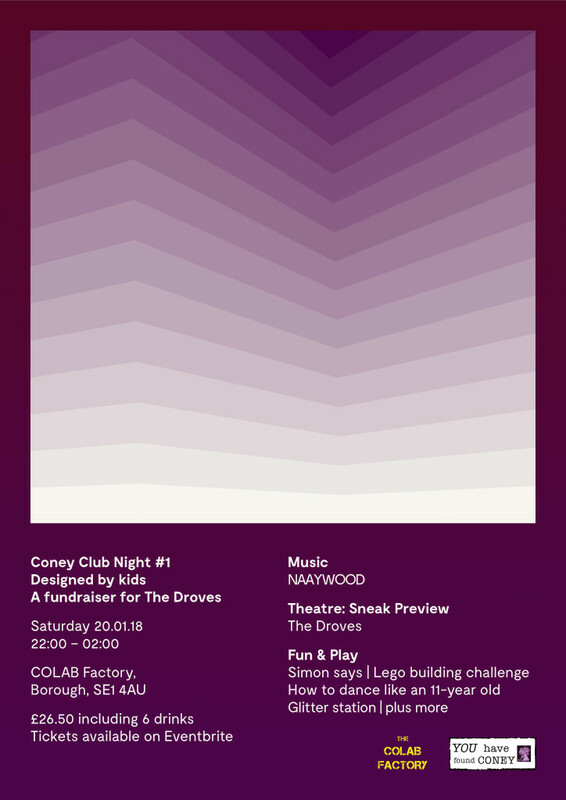 This event is a new kind of fundraiser, and all proceeds will go to the production of Coney’s latest project with 7-11 year olds: The Droves. We need to raise £7,000 to complete the production, and this night will raise £2,000. Help us reach our goal by bringing cash on the day, when you’ll have the chance to buy exclusive merchandise in support of The Droves.